The Smart Assistant is a feature that analyzes and picks out images from the selected image folder to automatically create a photo book. For the online creator tool, the Smart Assistant will only select the best images. But in the offline creator tool you can choose whether to use all the pictures or only a selection of the best. The Smart Assistant removes duplicates, blurred images and images that are out of focus. Using the selected images, it creates great page layouts based on which images best fit together. What is important to keep in mind is that the Smart Assistant creates a ‘first draft’ of the photo book. We recommend that you always go through the project to check that the pictures you want are included and that the layout is to your liking. You always have the option to customize your photo book after the Smart Assistant has worked its magic. By using the Smart Assistant, you can spend more time getting creative with clipart, masks, frames and backgrounds to really give your photo book a personal touch. Simply open a new photo book in one of our creator tools (offline or online). In the offline creator tool, a pop-up screen will appear where you can select the Smart assistant. Click on ‘use Smart Assistant’ and follow the steps, it’s that easy! In the online creator tool, first upload your images. 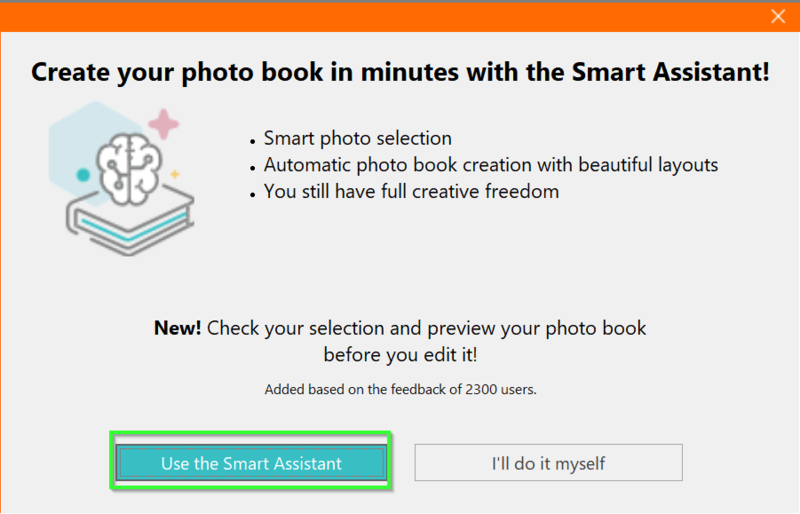 Then, click on ‘Create my book’ to use the Smart Assistant and follow the steps.